Am facing the issue with continuous streaming of ticks. Sometimes the ticks stop coming. It doesn't happen all the time but I see this happening at least once a week. So is there any standard way to retry the connection when we stop getting the ticks. I suspect we should get "onDisconnected" notification. Should we again subscribe for the ticks on this notification? What is the ideal way to get all ticks without any issues? Is there any java code samples for the same? PS: Am running my program from cloud with very good computing and network performance. Today @ ~1:50 pm it happened for couple of users. "This should be gone now. One of the instances were corrupt." How do I file a bug against publisher.js script that adds a trade button on the webpage? This is not a forum question and hence I am asking you. Can you post it as a query on the forum? Please check at earliest [ https://kite.trade/forum/discussion/comment/19512#Comment_19512 ]. I have provided all details. I still feel issue is with platform reg my account's privilege. There is no other account (owned by the same person) where the same trade has happened. Can you pls advise how/why this error msg has come? I am using KiteNet Excel utility and getting error : Get Access Token Failed Since today morning (01-OCT-2018). Please advise where the issue is and by when it will be resolved. I paid the historical data subscription the service. But when i run the examples.getHistoricalData(kiteConnect); i am getting an as well as in the response i found it was 0 candle data. Can we able know how much fund is there in User's account. Please let me know is there any API is there for this or not? Hi @Sujith... We are creating a platform where many retailers will be placing order through one API. As I read in the other thread, I have wrote to talk(at)rainmatter.com llast week to get multi-user access. Waiting for long time to get a response. Can you please help us in this regard? please check and help me. 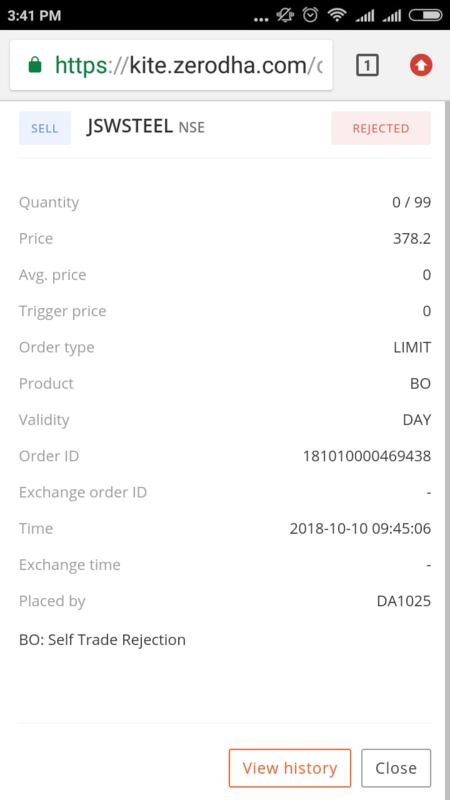 If u want to my zerodha id then i will give u.
i wan to place bo order. how to place stoploss in following link you show for trigger,target,stoploss but how to place trailing stoploss( by tick or any). if tick can you help for tick calculation. i am not understand this line "Also, make sure these values are a modulus of tick size as mentioned in instrument dump." It was running file till Friday. I have started a discussion around getting OHLC for the last minute. Please let me know regarding the same. Sorry for inconvincence, i gone through so many discussion thread and tried many solution, but not getting result so writing you. My second month subscribtion will expire on 19 july but No clue on the error. Please help me. please refer mentioned below Process I implemented, but getting error. I downloaded code from this url "https://github.com/zerodhatech/phpkiteconnect"
I Used this url "https://kite.trade/connect/login?v=3&api_key=**********" to get the requested token. "Authentication failed: Token is invalid or has expired. what is the logic for green and red bar on volume chart. hi I am facing an issue since half an hour now. the ticker is disconnected as soon as i log in.